In RealOrigin we’ve talked at length about the wallpaper, because it is an alternative to decorate walls is very fashionable, and offers a lot of advantages. Of course, if you want to achieve current home, you should be up to date on trends in wallpaper. Ideal for children’s rooms, the wallpaper has been traditionally used to line the walls of a room. However, this can be somewhat risky, since the effect can ultimately boring and tiring sight. Therefore, in recent times this element of decoration is being used in many other ways, providing spectacular results. 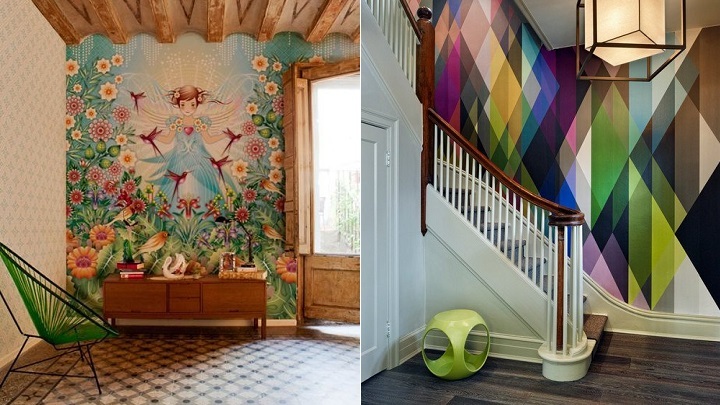 To prove it, today we propose four interesting ideas for decorating with wallpaper. Would you like to join us? As I just discussed today put wallpaper on every wall in the same room it is not the most common, although depending on the design can be an excellent idea. What we do is more common in recent times is to highlight a single wall and paint the rest. In this sense, it is best papering the wall we want to be the center of the room in question, for example, the place where is the table in the dining room or where is placed the sofa In addition, you can also use it to highlight the wall of the staircase, the hall, the hall, the bottom of the shelves … If you decant this option, see that the wall has no windows or doors so that the effect is much better. On the other hand, you know that the market can find also painted paper kitchens and bathrooms. If there is a wall of home worth noting this is the bed. To achieve this, most opted to include a headboard that matches the rest of the room and put a pretty picture. However, we can use many other options. One we like is to cover the wall with wallpaper. You can put just a piece of paper or, if you prefer, cover the entire wall. 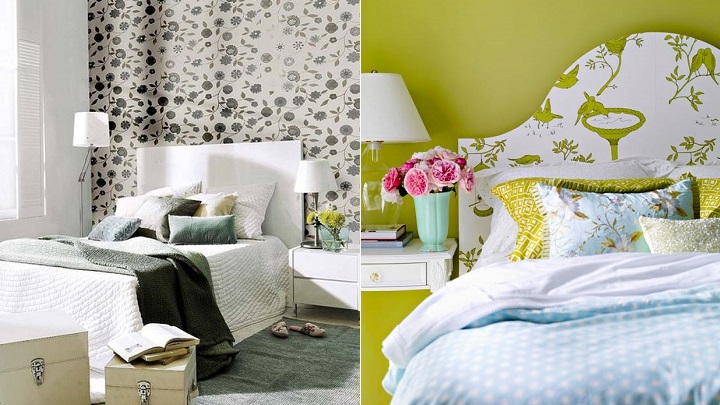 Moreover, you can also opt for wallpapering your headboard and thus give an original touch. Of course, if you have no headboard, you can avail yourself with a simple wooden plank. If you have an old or damaged at home but do not want to get rid of it, you can give a new life lining it with wallpaper. In fact, this decorative element is ideal for decorating different types of pieces of furniture: cabinets, drawers, dressers, sideboards, stools … And do not think you can only use it on the outside! In fact, in furniture with doors and drawers you can also wallpapering the interior, creating fantastic effects. If after papering a wall or furniture is extra wallpaper, we recommend that you do not throw it , because with it you can do really interesting things like lining desk accessories (folders, pencils, pencil, paper, filing cabinets …), create wreaths decorate boxes … And with the leftover wallpaper you can create extremely attractive pictures. 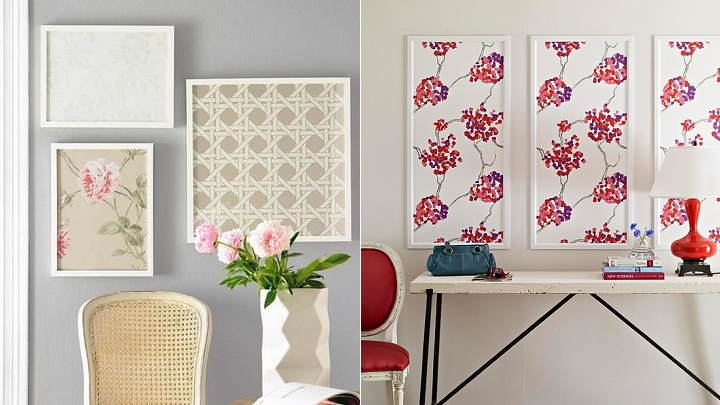 To get them, you just have to cut and paste paper on surfaces like canvases, cork or wooden boards and then frame them.